Before we begin, if you’re running Windows Vista or Windows 7, be sure to run AutoCAD as an an administrator. You can do that by right-clicking the shortcut icon, and then selecting Run As Administrator. From the status bar, right-click and select Performance Tuner from the menu that displays. Alternatively, you can enter 3DCONFIG at the command line. From the Adaptive Degradation and Performance Tuning dialog, click View Tune Log. Note the Version number from the Performance Tuner Log dialog. 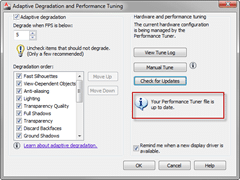 Close the Performance Tuner Log dialog to return to the Adaptive Degradation And Performance Tuning dialog. Click the Check For Updates button. This will ping the Autodesk servers to see if a newer version of the Autodesk Certified Hardware Database exists. 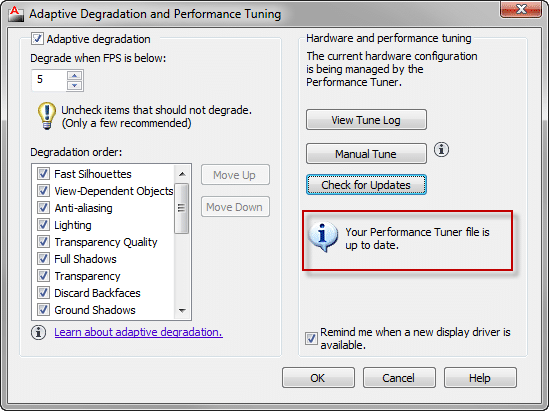 Assuming a newer version of the Autodesk Certified Hardware Database exists, the Performance Tuner Update dialog will prompt you to update it. Click Yes to update. After choosing yes, AutoCAD will download and install the updated database. 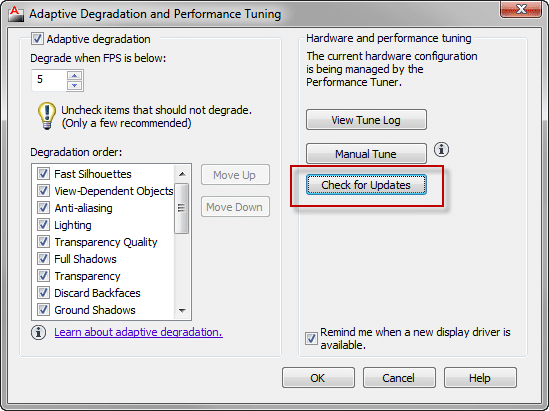 The Adaptive Degradation and Performance Tuning dialog will display a confirmation of this update. 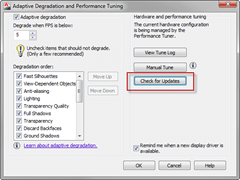 To verify the update did indeed update the Autodesk Certified Hardware Database, click View Tune Log from the Adaptive Degradation and Performance Tuning dialog. Exit out of the Performance Tuner Log dialog, and click OK to exit the Adaptive Degradation and Performance Tuning dialog, and you’re done. One additional step I like to do after updating the Autodesk Certified Hardware Database is to perform a Manual Tune. Like the update, this is done from the Adaptive Degradation and Performance Tuning dialog. Re-launch the 3DCONFIG command if you closed out of the Adaptive Degradation and Performance Tuning dialog. 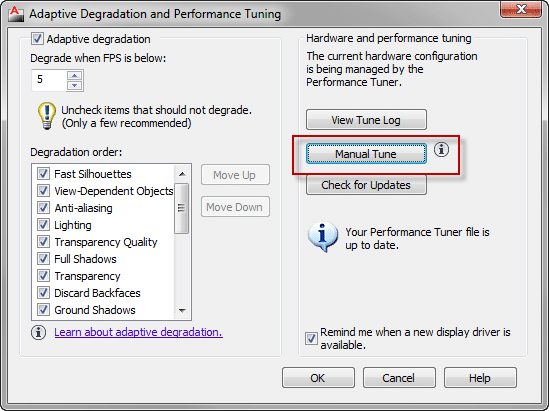 Click Manual Tune from the Adaptive Degradation and Performance Tuning dialog. 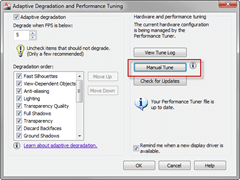 This opens the Manual Performance Tuning dialog. 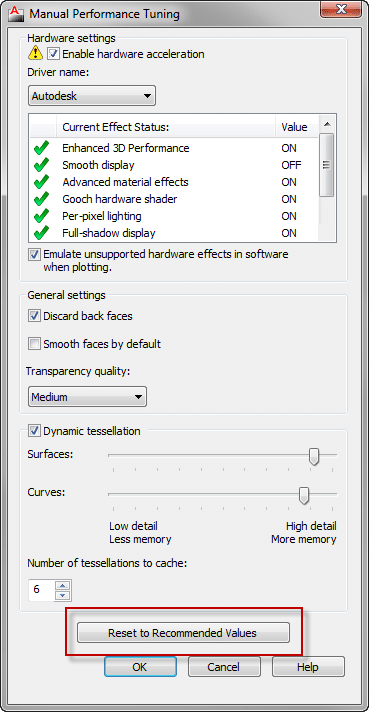 Here you can individually customize each of the settings, or let AutoCAD figure out what’s best by clicking Reset To Recommended Values.